21 year old Ritesh Agarwal must be a proud man today. Not only has he managed to build “India’s largest network of branded, budget hotels” valued at Rs. 2600 crores, but has also acquired a rival in less than one year of its entry. After a lot of murmurs around the deal, budget hotel aggregator Oyo Rooms finally looks set to acquire cash-strapped rival Zo rooms, Softbank has confirmed in an earnings call. This deal will firmly cement Oyo Rooms as the dominant player in the budget rooms segment eliminating its only competition hitherto. Recently established travel OTAs like MakeMyTrip and Yatra recently introduced budget accommodation and had since removed Oyo’s listings from their respective portals. Zo Rooms and Oyo Rooms had been fiercely competing for a slice of India’s $20 billion hospitality pie. In April this year, Oyo Rooms had filed a complaint against Zo Rooms at the Delhi High Court for allegedly using their “copyrighted data”. Oyo had produced evidence such as emails, CCTV footage and theft of its ‘software’ by few of its own employees who had supposedly left to join Zostel, the parent company of Zo Rooms. A month later, Zo Rooms had apparently retaliated with a marketing ambush of an Oyo Rooms promotional event at India Habitat Centre. At the entrance of the venue, Zo Rooms had installed signs that said “‘For a good app carry on, for a great app download Zo Rooms”, in addition to lots of other promotional material. All that seems to be a thing of past now and Zo rooms, which had raised a funding of Rs 650 crores not too long ago seems to have thrown in the towel. The deal is touted to be an all-stock, and all-asset deal in that Oyo will not be responsible for Zo’s dues to agencies, vendors and advertising firms. Zo’s app and website had been inactive for months however all the founders had been silent on the acquisition deal. Reportedly, the 7 founders will make an exit after the acquisition while 40% of Zo’s employees will be absorbed within Oyo. 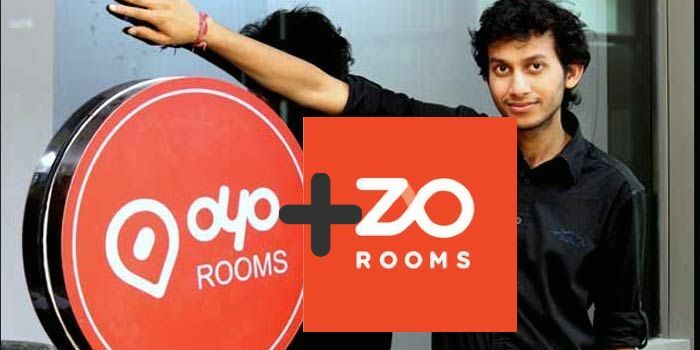 The new deal will add Zo’s 11,000+ rooms to Oyo’s existing trove of around 30,000 rooms across 130 towns in India and the new Zo+ Oyo entity would compete with new entrants like Treebo hotels and MakeMyTrip, Stayzilla, Goibibo amongst others.